In partnership with the unparalleled Newbridge Silverware, Carleton Varney draws on his extensive design experience to bring you exceptional giftware for your home and more. Curl up with a cozy cup of tea with this delightful set for one. As a gift for yourself or someone else, it conveys an air of timelessness and levity. This is the perfect set for when you want to feel like a queen. I use mine everyday. 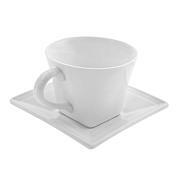 The quality of the bone china is esquisite. Carleton Varney always presents the finest quality of bone china. This would be a beautiful gift for your best friend. This is a beautiful set and the rose pattern is really pretty. The set arrived well packaged and ready to use. 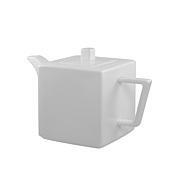 The teapot is delicate but functional and holds up well to hot water. I tested and decided it was too pretty to use daily so I am saving for those special occasions with friends. This set is so pretty and I use it nearly every day. I love that I can actually put it in the microwave. Usually you cannot do that with china. The detail on this beautifully painted tea set is amazing. I love it! 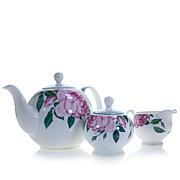 Hope to see more tea sets in different patterns, on HSN. This teapot and cup combination is wonderful. I enjoyed my morning and afternoon tea from this beautiful ensemble. I plan to purchase others for my friends. 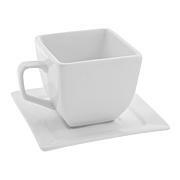 The tea pours perfectly, no spills. The rose design is matched so artistically. 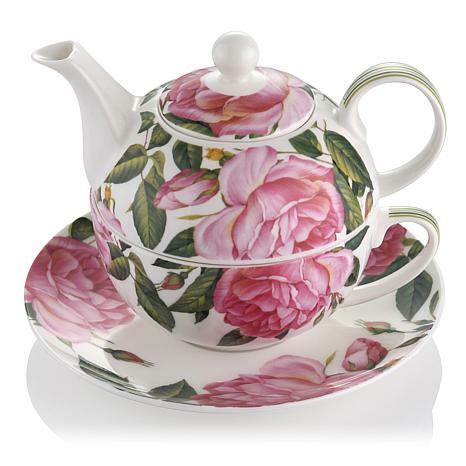 The rose pattern, though lovely, does not match up whichever way you turn the cup and pot. The lid has a stop tab built in, but there's no indentation around the lip of the pot for it to catch into, so when pouring your tea, it would just fall off. So to wrap up, good for display only, and I didn't pay this big price tag to not be able to use it! Returning.